For all those of you who have used the JailbreakMe.com method of jailbreaking then you took advantage of a PDF exploit in the Safari application. This is good that you can jailbreak your device so easily but it also means anyone with the right know how can run code on your iDevice. This means that if in the wrong hands it could be used for malicious purposes. The iPhone Dev-Team or Apple will eventually patch the PDF hole, probably the latter. For now you need to make sure your device is protected so that you don’t fall into any malicious traps. You need to install a Cydia package called PDF Loading Warner, this package displays a pop-up when your device is about to open a PDF. It won’t stop this exploit but it will let you choose not to open a PDF that might be malicious. It has caused some issues with iBooks when opening PDF files as you have to dismiss the pop-up numerous times. However it’s a small price to pay for such an easy jailbreak. So let’s say you have an App on your phone that you really need, but other people would keep going on it and you don’t really want them using it or seeing what it is. Well there is a simple way to disguise an app on your iPhone as anything you want. Let’s say the app we want to hide is Cycorder. First of all you have to SSH into your device and go to your Applications folder and open the relevant folder, in this case being Cycorder.app. Note: these will vary on application, but the files needed will remain the same. Now copy the files icon.png and info.plist to your computer. Before editing either it’s a good idea to backup the files just in case you go wrong. People using the iPhone will most likely use icons to refer to an app, so changing the icon of the app you wish to hide is the first thing to do. First you need to get the icon from another app or you could make one yourself. Simply pressing the Home button and Sleep/Wake button will capture a screen shot of your home screen and you edit the icon to the correct size etc. Note: Always save the icon as a png image and make sure it’s transparent. Downloading a free app off the App Store would maybe be a better idea for this as it gives you a quick and disposable way to disguise an app. However think about if people are likely to click on it, so find something boring. Once you’ve edited and saved your new icon, save it as a png and copy it back to the app folder on the iPhone, replacing the original. The second way people will know which app is which, is via the name underneath the icon (which by now you will have changed). To change the name simply open the plist either using a text editor or a dedicated plist editor such as iPodRobot’s plist editor. and change the value below it what you wish the app to appear as on the home screen. Once this is done, save the plist and copy it back to your device, overwriting the old one. Now re-spring or re-boot your device and the application will now be disguised. 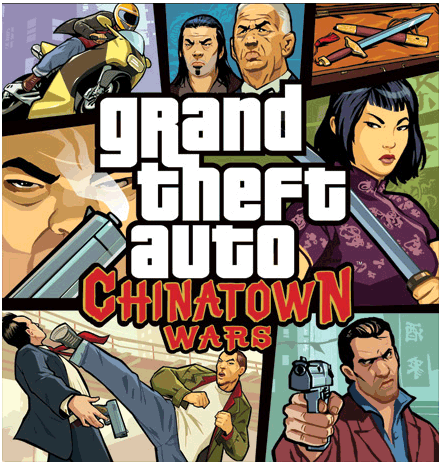 Rockstar Games have announced that Grand Theft Auto: Chinatown Wars, from Rockstar Leeds, is coming to iPhone and iPod Touch later this year. The award winning game is making it’s way from the Nintendo DS to the PSP platform and now the iPhone & iPod Touch. The game follows the story of Huang Lee, a young Triad who travels to Liberty City after the mysterious death of his father. Players will navigate their way through the streets as they uncover the truth behind an epic tale of crime and corruption within the Triad crime syndicate, delivering the unprecedented amount of depth that has become a true trademark of the Grand Theft Auto franchise. Numeric Battery On iPhone Killing Battery Life? There has been many reports that enabling the numeric battery feature on the iPhone actually kills the battery life quicker. Some people have reportedly found a massive increase in battery life after turning off this simple feature. Especially those with jailbroken phones who use SBSettings to turn on the feature. Some people oriignally thought the battery died quicker, but thought it was a psychological thing and that you thought it was as you could see the percentage go down. However I’ve now turned off the numeric battery for good and hope I get better battery life as currently it’s not lasting a whole day with light use. Re-Appearing Mail From Yahoo! Mail? I’ve been experiencing this problem a lot lately as every few days even after I’d deleted some email pushed to me from Yahoo! 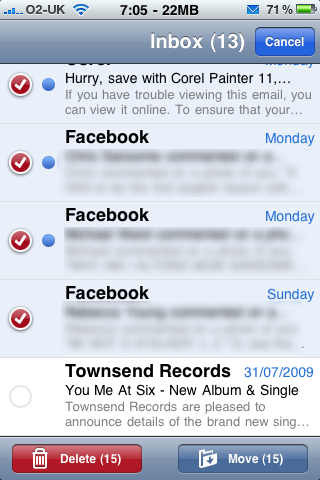 Mail, it would re-appear a few days later saying it had been unread. I’ve been trying to think of a cause of this, it could be that when I delete mail I don’t give it long enough for it to sync back with the server; but it runs as a background process so surly it can, right? Or maybe it’s a problem with Yahoo! Mail, which it could be but I’ll be testing out some things to test it and see if I can work all this out as it’s not convenient finding 10’s of emails re-appear. 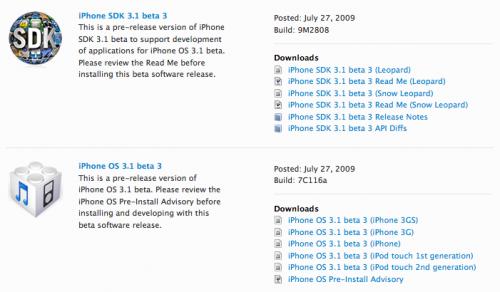 Apple has released iPhone OS 3.1 Beta 3 (build 7C116a) and the iPhone SDK 3.1 Beta 3 (build 9M2808) to developers. So far there are no interesting developments that have been found, though it is suspected that Apple might be implementing tools for use in Augmented Reality applications that require the ability to overlay real-time downloaded data on top of live video. • Copy and paste videos. There is a 15 MB limit for copying/pasting videos or images. • Tethering Counter – If you go to Settings -> Genral -> Usage on your iPhone, you’ll notice Tethering data which shows how much tethering you’ve used. • Springboard Icons – When you hold down the Springboard icons they no longer vibrate. • Baseband Updated – The baseband has been updated to 05.11.04.